At least one topic that doesn’t appear to be addressed by this outline (but I have to deduce that and may be wrong), the prevailing issue of ‘lore’: fundamental beliefs of ‘truth’ that have never been tested — repeated and relied upon by all as if they were true, but often are not. Thanks so much for posting the first comment. Sorry for the slow response – I have been under the weather a bit this week, but this thinking has been simmering on the back burner. I just posted some thoughts about culture, patterns and paradigms on my blog (http://patternsandpossibilities.squarespace.com/blog/2010/1/17/a-look-at-culture-and-paradigm-as-a-prelude-to-change.html). 1) Can culture be overtly changed? I’d have to say yes, culture can be changed, but may not be changed the way you want. In my experience with mergers, the culture of the parties involved in the merger are changed when joined together, but you cannot predict or control the formation of the new organizational culture. 2) Can culture be influenced? Yes! This is definitely where I want to spend more time discussing! Outstanding input, Mary. Definitely worth the wait. I wasn’t originally sure how to address the complexity aspect, but your analysis on patterns, similarities & differences, and relationships is so fundamental to org culture issues, I feel it needs more exposure in my thread. I hope to add additional org complexity insights, both on the newly added “patterns & dynamics” post (HSD foundation) as well as the traditional intervention aspect (Kotter foundation). As we’ve discussed, Scott Page introduces important criteria around a balance of diversity, interdependence, communication, and learning/adapting. To effectively grapple with complexity, I want to be sure all those elements are included. We can certainly evaluate how to best structure this content. Just keep in mind one overarching objective: to keep my post relatively accessible for general business and government application. Great progress .. thank you again !! Chris, I feel like we have been introduced, given Mary’s sharing of your conversations. I am the other half of Patterns and Possibilities, and I just want to step into this conversation, if that’s okay. What a great couple of questions you pose, and I look forward to the posts and comments to come. We talk about the role of a short list of simple rules as the “seeds” of culture. I had an article published in the ODN journal a few years ago, and can send it to you, if you would like to see it. It’s called “Simple Rules: Organizational DNA.” In it I explore the concept of simple rules, as we think of them in Human Systems Dynamics. Sometimes a short list of simple rules is articulated and openly discussed, being used to guide decision making–both organizational and individual response. If you visit the HSD Institute website, you can see the simple rules we have used since we formed in 2003. Most of the time, however, the short list of simple rules for any group is unspoken and followed unconsciously. It has been my experience that people, when asked, can name simple rules they follow, exposing some of those underlying dynamics you speak of. Naming new simple rules to create the patterns of interaction that give rise to a new culture is relatively simple. On the other hand, making those new simple rules overt across the organization is very difficult–even impossible if it’s not supported throughout. It takes lots of conversation and intentional action to make them part of the policies and procedures, as well as part of individual decision making. Yes, I feel like I know you as well. Mary has said great things .. There are so many touch points between my experience base and your collective HSD work that I won’t try to repeat them all here. Suffice it to say, as I’ve shared with Mary, I’d like to introduce a representative set of HSD perspectives in my series. So yes, I’d appreciate any additional papers. I’m very intrigued by the complexity view of culture. Without that overlay, culture looks amorphous. With the forces of adaptive systems in play, the patterns and rules start to appear. I’ve taken the Scott Page challenge. Can we harness complexity? I say, ‘yes’. Looking forward to learning more with you guys – a virtual team? Heh .. Kanter’s Change Masters was the original inspiration for me getting into org dev / HR consulting, then change mgt and now general tomfoolery. I see, or infer, that you’re into Charles Handy as well. I had the privilege of being in a master class with 9 others in a London hotel meeting room for three days back in 1992. For me it was like going to a favourite rock concert .. a real buzz. And thanks for your recent RT. Trust I am making at least some sense ? You’re making a ton of sense, Jon. I appreciate the time you’ve taken to respond to my posts, here and elsewhere. Yes, Handy is my latest virtual mentor, and I’m getting a huge dose on motivation and role theory (so far) .. as foundations to his thoughts on the dynamics and types of org culture. What I’ve read from him so far is consistent with Schein. In fact, Handy has cited him a few times. I feel like I’m on a journey. Sad to have missed that 9 person class in 1992. Hope you have good notes. If not, certainly some invaluable memories. Again, any and all insights appreciated. You clearly have much to share in this space, and I imagine, many others. I thought Bruce Stewart’s holding forth on Oswald Spengler, Handy’s “God’s of Management” and management inertia was an amazing short essay. Mind you, Bruce is a friend who until recently lived just 10 minutes away, and we met for coffee and such discussions every couple of weeks or so. Privileged to know him. How ironic. I just opened Handy’s Understanding Organizations where I left him last night .. though now I must dare to leap ahead. Hate to skip Leadership, Power & Influence, key topics, for certain .. I can’t finalize my next post in this Culture series until the OD Master has a few words w/ me. Yes Jon, I’m finding you & Bruce .. not to mention Paula, Bas, John T, Mary N .. quite an insightful bunch. I’ve had the privilege of sharing many coffee’s with Mary Nations here in Raleigh. So I know what you mean. Nothing like drawing an idea – a new paradigm – on an actual napkin. At some point, we’ll have to have a killer meetup. London? DC? Chicago? Will have to be after I get this series on culture change knocked out .. While I’m trying to march through more of Handy’s Paradox, Jon made me also pull McLuhan’s “Understanding Me” from the shelf. A gathering…just a get-together for me would hold FAR more interest than the darned conferences. I am sharing this comment in preparation for the March 24 CBODN Gov’t SIG. I work in a small”ish” fed gov’t as an internal OD/HR consultant. I want to share my current situation and hope to get your and others insights on culture change vis a vis performance management. The organization recently embarked on an initiative to totally revamp the performance mgmt system. It’s got backing throughout the organization based on many years of employee satifaction survey results, outcomes from a recent strategic planning retreat, and a new Chairman who is 100% committed. A new form is only as useful as employees and supervisor that use the form to guide meaningful conversation on performance. So my dilemma is how to guide the group down the road of producing what management wants (a new appraisal form), when what we are really looking at is culture change. Here’s a little more background on current state: most employees rated at the highest level; historically little conversation about establishing goals and performance expectations; most employees already performing well and largely committed to the organization’s mission (in the absence of a perf mgmt system); most performance conversation is about behaviors; lots of talk about needing something new, but unsure what that looks like. At a recent meeting, I mentioned that this effort is really about culture change. There was some silence after the comment and head nodding in agreement. I do not think we create culture change with a new appraisal form. However, artifacts like this do create some change. I want to be realistic with myself and the group about what we can do to “ignite” conversation about what this change means to the organization and our role in guiding the change. Look forward to the March 24 conversation! Excellent insights Jill, thanks for sharing them. I think you are right when you say you can’t change culture with a new appraisal form alone, but you can certainly reinforce the messaging and expectations (hopefully, as articulated by your leadership team) that serve to frame your proposed culture. An aligned appraisal provides context to spell out the desired behaviors of your alternative future state. Many steps need to be taken to communicate and “spark” the sort of changes you describe. Kotters “8 steps” in Leading Change may be useful. I plan to post on those soon. I’ll link to it when I do. On the challenge at hand, once your leadership has framed a revised vision for the organization (Kotter’s step 3), the performance management appraisals can and should be aligned with the new org vision. Doing so communicates expectations, empowers people to embrace them, and rewards them if they do (Kotter’s steps 4, 5 & 6). Of course, there are no panaceas or silver bullets in culture change, which is why adherence to Kotter’s checklist sometimes gets knocked. Fair enough. But his approach (and others like it) can serve as a useful guide to focus energy of those wanting to drive change. To set the stage more broadly: Schein reminds us culture has many dimensions, all of which matter. Handy talks about alternative org structures and their influence on cultural forces. Because these factors interact, it makes for a complex undertaking. That means there is much more to the story (and more to come in this series), specifically in the area of understanding complexity, patterns and adaptation. All of that said, the short answer to your question is ‘yes’ – an aligned performance appraisal is a key element in a successful cultural transformation. Sounds like you have some momentum building in your org. Good luck with it. I’d love to hear how your efforts proceed. If it were me, I would focus on crystal clear job definitions and responsibilities. And then map time spent during the day. The problem I’ve seen most often with “performance metrics” is the absence of clear job definitions. Once the conversation starts around job definitions it usually gets to time on task, resources needed, etc. It’s often a pretty good way to understand where are the points of friction so they can be mitigated. The real problem is that very few organizations have crystal clear goals and job definitions. But that is the most important thing to talk about. Absolutely, Michael. Excellent point. Traditional RACI diagrams can be an effective resource to address role issues, along w/ job descriptions, of course. Have found that in complex scenarios (which lately is just about all large organizations) the boundaries between roles are where the trouble exists. Conflicting agendas, semantic problems. Clarity. Role definitions. Defining common terms. Simple remedies to help grapple w/ complex problems: a sensible approach. Step away from the form. What is a form? It’s the binary code of attempting to automate something that is inherently a heuristic. We’ve become so indoctrinated by the machine and its machine parts that we cannot stop feeding the beast. Stepping back to reality there’s the design of the form: What data will it collect and why? I’m pretty sure that you can easily let them get all entagled with themselves over the “why”. If you can’t take action on the data there’s no purpose to collect it. They can’t give you an ROI (which they’re usually requesting OF you). They’re just throwing money at avoiding the real issues. I’m looking forward to your presentation on the 24th. Some things I’ve been thinking about. Culture, the way things get done around here. That’s really the tangible definition I’ve seen. What is written on paper and marketing materials often stands in contradiction of the reality, yet many try and manage to or even improve what is written and not what actually is reality. What effect do covert processes and power and politics issues have on org. culture? We know leadership, or lack of it, has an impact, but what else must be addressed and managed as a component or contributor to culture? Hi Scott, these are great questions. Thanks for posting them. I view the covert processes, power and politics as being fundamental drivers of org culture. Any attempt to influence org change must address them. All the OD sources I’ve tapped in this series are consistent in that messaging – E.Schein, C.Handy, and most recently, J.Kotter. I believe Kotter has the most discrete list of interventions, ie., his “8 steps” in Leading Change. I’m hoping to blog on those soon to get his list back into view, adding some updated thinking. His ideas are solid, with one caveat: there are no silver bullets. Will link to that post when it goes up. Also stay tuned for updates on Complexity in OD and Culture Change in Gov, as important dimensions of our 3/24 CBODN Workshop. Hope to see you there !! No wonder all these biz people think busting a silo is ok, your definition of culture is wrong. No, it is not an amalgamation, not at all. Corporate culture is a fiction. Culture is a reality at the level of the functional unit. Corporate culture is a prioritization of functional unit culture generally to the detriment of all the other functional unit cultures in the organization. If people could lead, really lead, functional unit silos would present no challenge at all. Go ahead, bust all the business unit silos you want to bust, but busting functional unit silos is to compromise the knowledge that is organized by them, and the rationality that well functioning functional unit silos provide. To bust the functional unit silo is to discount expertise. If you don’t want expertise, don’t hire it. Integration apps and shared vocabularies embed costs, invisible costs, into the operational side of the business. IT gets off the hook here. These apps and vocabularies should be banned. Use aspect-oriented programming to eliminate the need for such things. Embedded compromised definitions in an app at the model level makes UIs irrelevant. But, really, it is the lack of the ability to lead that is at the core of all this silo busting. I think I disagree with “Corporate culture is a fiction.” To me, the missing factor is power. The way it works out is the CEO hires managers whose proximate rewards are pleasing the CEO. They in turn hire managers who are in the same position vis a vis them. And so on down through the organization. The Actor with the most power sets the framework for power distribution through out the organization. I agree 100% that culture is made visible at the levels of the functional unit. But if the distribution of organizational power is ignored, it misses the levers of organizational change. Absolutely agree that effective leadership is key. There are a variety of skills a leader must possess, including knowing how to skillfully guide a diverse organization using diverse approaches. One size fits all rarely works. I didn’t intend to advocate “toppling silos” but rather, learning to navigate and communicate across them. Silos serve many important purposes, as you indicate: centralizing expertise, establishing control, eliminating variables. It is ultimately ‘hardened silos’ that worry me most – those that resist improvement or adaptation. Agreed – authority & power are fundamental dynamics of human organizations. How leaders use them and how they choose to delegate (the root force of empowerment) is key. I’ve learned wielding power unilaterally is easier than sharing it, but I’d argue, ends up being effective only in certain circumstances (battle, strategy rollouts, adverse conditions, emergencies). The collaborative approach requires delegation and trust, and can be effective when navigating unknowns (triage, customer service, research & development, invention). Rule-based hierarchy (aka ‘silos’) are good for controlled outcomes (manufacturing, accounting, quality). As I responded to David above, I’ve never seen “one size fits all” leadership be effective. Charles Handy does a good job of describing how ‘power’ culture compares with other approaches, which I cover in post 2 of this series. Cultures need not favor stability. Functional unit cultures are defined by the functional unit manager. That manager determines what paradigm within the functional unit discipline will be the primary driver of practice. When staff is hired, they fit into that paradigm and any paradigmatic change that the functional unit manager wants to undertake. If you are not getting the paradigm you desire: 1) get clear about the paradigm itself–not being a practitioner, you know less, way less, than you need to know to insist; 2) get to know the manager and each staffer; 3) find the staffer that understands the paradigm you want to move to; 4) write that staffer’s interpretation of the paradigm into your project requirements; 5) get that staffer on you team; 6) do not alienate that staffer from the functional unit manager–protect this person. Most of what you know is hype, buzzwords, and some generic indications of what was done elsewhere. It may not actually work. What you know might be the exception, rather than the typical–yes, your company is typical. “Functional unit cultures are defined by the functional unit manager.” . . . within the context of power distribution in the organization. I think you’re onto the big question in organizational change. It might be useful to look at from the point of view or organizing Time and Space. The most reliable indicator of leadership culture in my experience is how they spend their time. My bet is that if one does a careful analysis of time spent it helps to clarify what is really going on. My hunch is that if “time spent” is the focus, “culture” can change in tipping point times. Consider GM. Or the effects of the Obama adminstration on the “culture” of Congress. Consider the actual time spent on task for either teachers or students in our present edu system. As long as the focus is on the words, instead of the behaviors, it creates the notion that culture is slow evolve. But if the focus is at the granular level of “time spent in what space” it becomes more clear that they can change with seemingly little effort. The supporting framework from sociology is the Hawthorne effect. From medicine, it’s the placebo effect. Well said. Action (when it occurs) does speak louder than words. Unfortunately, getting folks to act can be one of the biggest barriers of all. I agree w/ David, stability in and of itself is not bad, and not all cultures focus there. But obsession with stability is a problem. And if I’m right in my end thesis that all organizations revert to silo cultures with scale, and silos favor control and the status quo, we arrive at a dangerous potion of organizational grid lock and complacency. Look around. There is ample evidence. If executives don’t act (allocating time, adjusting priorities, rewarding target behaviors) then it is far too easy for the organization to cling to the perceived safety of the past. Unfortunately, I believe it is a false security. 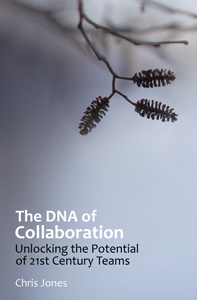 The path out of organizational gridlock must be a new culture of collaboration and discovery. I’ve posted on that elsewhere in this blog, and will post on it further. Meantime, we have a critical need of adapting our industrial paradigms – finding alternatives that will work in the more dynamic, less forgiving knowledge economy. Good post, great comments. I asked the question to a group at an OpenGov camp the other day. What is culture? The shortest answer was “The default behavior” of people. What I am interested in and what I think you are getting at here, is what influences that default behavior. Leadership is obviously a factor, but I would like to suggest that leadership is something everyone in the organization can practice, by having a clear idea of what the new behaviors should be and taking action within their sphere of influence, however small that may be. My answer to your question can culture be influenced is a resounding YES. Of course it can in many ways, but the most important way is one conversation at a time. Enable people to talk freely about what needs to change, give them permission and the means to make it happen and they will. Forgive my delinquent response to your excellent comments. I find thoughtful comments are where the true magic emerges, especially when a dialog begins. Leadership is clearly not reserved for executives, as many assume. Real organization change can spark from anyplace in the hierarchy, driving innovations large and small. With the right conditions, change can take root and flourish. Creating the necessary initial conditions is one of our main challenges. Let’s continue the conversation. I’ll look for you online. As we talked about over that the #ecosys wiki, what I’ve been calling an Activity Space/Time denoted by As/t. What I think I’ve observed over 40 years of managing Print centric projects both with small and large organizations, is that the design As/t has a very different culture from the Print Purchasing As/t from the Marketing As/t. I’ve had my greatest success in taking the resiliency of the culture in a specific As/t as a given. The task of trying to change it is too time consuming and finally almost impossible. However, i have also found that a change in the controlling As/t can lead to very quick changes in behavior. As an example, in one engagement I worked with the Print Purchasing Dept. They had a long standing method of producing an annual report for a global. They then got the mandate from whoever it is that can fire the manager that costs had to be cut significantly. With an intervention that managed a different workflow – consistent with the fears of that dept – we managed to save a couple of hundred thousands of dollars with a few changes in the workflow. My point is only that once one understands and takes as given what ever is most frightening at on As/t and takes step specifically mitigate those fears, it turns out what seems to be an intractable culture can change very, very quickly. Barriers to 2.0 Adoption | making space for Possibility.